Last month we took a family vacation that had me, my wife, our 3-year-old son (Dominic), our 1-year-old daughter (Cora), my mom and my dad, my grandmother, my sister and her boyfriend, and my brother, his wife, and their 1-year-old son sharing a beach house on Oneida Lake for a week. (A four generation vacation!) Sylvan Beach was right outside our back door. On our first afternoon on the beach Dominic very hesitantly took a step into the water. A small wave washed up over his foot, covering it in seaweed. He instantly ran back out of the water declaring “I don’t like that,” and stayed away from it for pretty much the rest of the week. Cora, on the other hand, charged right in so fast we had to chase after her. She laughed, kicking her feet (sneakers and all because we didn’t think she’d want to go in the water) and stomping and splashing around. She bent down and reached her hands into the water, bringing them back out with little fists full of dirt and mud. She didn’t want to hold anyone’s hand and she didn’t want us holding her back. If it was up to her she would have swam to the other side of the lake just to see what was there. I couldn’t believe how brave and carefree she was. I’m more like Dominic. Cautious, slower to try new things, untrusting of the unfamiliar. Before I was a parent I never would have thought this was possible, but I admired my 1-year-old for possessing a quality that I just don’t have. She is utterly fearless. Later that day I carried a tired Cora down the beach, walking slowly along the water’s edge. After a few minutes her head became very heavy against my face and I knew she had fallen asleep. 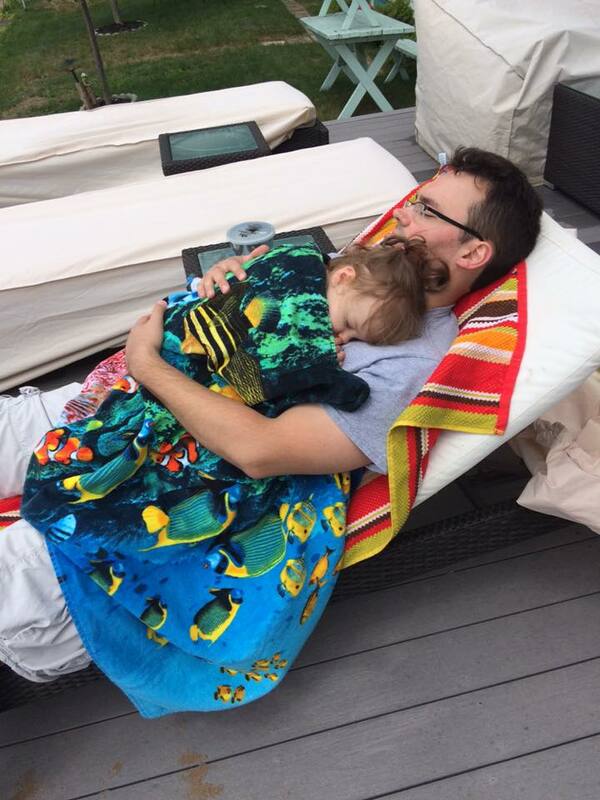 I walked back up to the deck and laid down on a beach chair with Cora on my chest. Amanda covered us up with a couple of warm, dry towels as blankets. I closed my eyes and just felt the sun shining down on us and listened to the waves gently rolling up to the shore. As I held my sleeping daughter on that perfect day I thought about the way we spend so much of life. Get up, get ready, get out the door so you can be to work on time, be at this appointment on time, get this work done on time, pick up the kids on time, get dinner made so you can get to bed on time to do it all again tomorrow. You’re trying to get through the day just so you can get to the next one. When you get away from that you get a chance to live the day at its own pace. You get hungry, you eat. You get tired, you take a nap or go to bed. You laugh with your family, you play with your kids. And sometimes you just don’t do anything at all for a little bit and that is perfectly, wonderfully okay. It is so good for the soul to live life instead of just getting through it. We have gotten so far away from what life could/should be. Holding Cora and feeling her fast asleep on me, listening to her gentle breathing as I felt a cool breeze blowing over us was the most calm, peaceful, serene moment I can remember in years and I can’t begin to tell you how much I needed it. I will hold that feeling with me during the stressful times. And I will try to be just a little braver, like my fearless daughter.